desheviy_shopping Since I often go to different countries of Europe and cannot do without shopping, then for me every trip is an expectation of new purchases. To go to an expensive store and buy, for example, a ready-made look, which stylistic consultants will help you with, may not be affordable for everyone. Yes, and there is nothing interesting in this. PRIMARK is a popular chain of clothing and accessories stores, mostly in the Casual style. In the stores of this network you will find both women’s and men’s and children’s clothes and accessories. 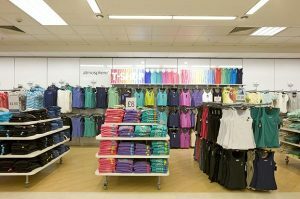 PRIMARK owns a number of clothing brands – the basics of the range of stores – Rebel, Young Dimension, Atmosphere, Denim Co., Cedar Wood State, Opia and others. Having started in Ireland, in Dublin, the network quickly expanded throughout Europe. At the heart of the company’s policy is austerity on everything that does not harm quality – advertising, logistics, and so on. Therefore, in the Primark network you can easily change your wardrobe for 50 euros. First of all, I look for this store and go there. Yes, yes, this is the same store, the brand of which can be seen at every second seller in SAFA – this is Atmospehere. Probably, this is the cheapest store I’ve ever met in my life (not counting stocks and second-hand). The most interesting thing is that in stocks and second-hand goods, prices for this brand are much higher than in the store itself. Atmosphere is one of the most popular brands of PRIMARK Corporation. At the core of the brand’s collections are casual women’s clothing with high quality and reasonable prices. T-shirts and raglans with prints, jeans, dresses and jackets – every woman of fashion can find things to your liking. A few examples to understand the price category. hairpins and cosmetics 0.50-5 euros. Prices are very impressive, and these prices are not in the days of sales. What is happening during the sale, I will tell at the end of the article. By the way, the quality of things is good. In Primark you can find clothes for both children and women of any size. There are any styles and all age categories. Of course, all these countries combine stores that can be found on every corner. These are Zara, H & M, C & A, etc. They are also quite low prices and acceptable quality. By the way, in Spain in such stores as Zara, Pull & bear, MANGO, Bershka, the prices of goods are much lower than ours! Not even in the days of sales. And all because they are Spanish brands and in their home country are much cheaper. For example, this handbag in MANGO in the city of Salou (Spain) cost 15 euros, when we, in Ukraine, if translated into currency, left 26 euros !!! Many tourist and business trips pass through the city of Barcelona (Spain). On the main street of Rambla you will find all the shops that I listed above. Still there I advise you to visit the store EL Corte ingles. So far, this store has been found only in Spain. Very good quality and low prices. Excellent sweaters, pants can be bought for 10 euros.Of course, if we talk about Spain and Shopping, do not forget Andorra – the beautiful nature and paradise in the form of a large number of shops at the foot of the mountains. Here people with the most different tastes and financial opportunities can rummage. Shopping City is a stock place of famous brands and brands (30% -70% discount). Here you can find Mango’s coat for 20 euros or a handbag from D & G for 15 euros. In this case, things will be relevant and consistent with the current fashion. You can get there in two ways: from Barcelona Sants station or by excursion program, for example, Bus Plan. Independently it will be cheaper, with a guided tour there and back costs 60 euros.